Elegant, understated and chic, Alyn Williams at The Westbury is a shining star in Mayfair’s ever-growing Michelin constellation. The menu is based around only the best seasonal ingredients, using conventional techniques with a contemporary twist. 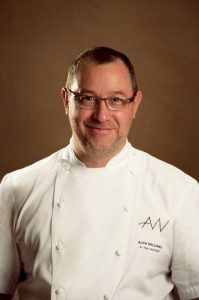 Prior to the Westbury, Alyn wor ked with some of the biggest names in the business, including Gordon Ramsay and Marcus Wareing for whom he was Head Chef at his two Michelin Starred The Berkeley for five years. 2012 saw his light progressive style of cooking win him the coveted ‘National Chef Of The Year’ title, along with his first Michelin Star, three AA Rosettes and being voted 15th in the National Restaurant awards where it now has 4AA Rosettes.